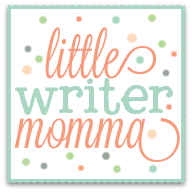 Do you ever have days when you doubt your ability to be the mom you want to be? The mom your children deserve? The mom you know God created you to be if you could just....get it all together? Confession...I often find myself concocting scenarios in my mind of my children sitting in therapy 20 years from now and what they might be saying to their therapist about their crazy mother! "She should have given us more structure." "You should have SEEN our house some days...it looked like a tornado ripped through and she just let all that stuff SIT there! What a slob!" Well, I'm happy to report that if you have doubts about being a mother you are not alone! I'm right there with you and just finished reading a book that speaks directly to those doubts and insecurities. 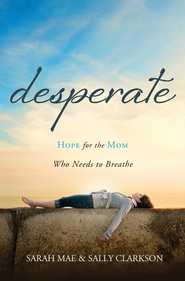 Desperate was co-written by a momma with three young children who is at the same stage and age as many of us (Sarah Mae) and her wonderful mentor (Sally Clarkson) who has years of wisdom and experience to share about motherhood whose children are all almost in their 20's now. Ironically (or perhaps not so much!) I started this book on a day when I was feeling empty and am finishing it feeling quite full. In part because motherhood just seems to ebb and flow that way-- one day you are flat on your face surmising a survival plan to get you through to the end of the day. Three days later you are back on top of the world feeling like you're rockin' this mom thing never to flounder again. In between we need books like this! 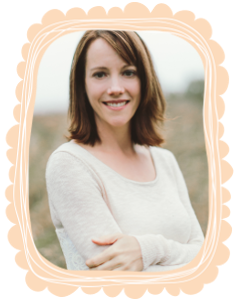 Honest accounts of the days flat on your face (thank you Sarah Mae) and oodles of wisdom garnered from years of mothering experience and learning to trust God in ALL of the details (thank you Sally Clarkson). This book is unlike other parenting books I've read (and I've read a LOT of them!) 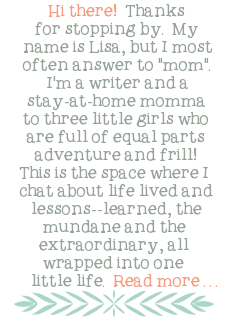 because of the team approach-- younger, inexperienced mom and seasoned, wiser mom. Sarah writes from her experiences as a young, overwhelmed mother who finds many of her days at home to be tedious and challenging, often leading to bouts of depression. Sally responds to Sarah's experiences and questions with wisdom, grace and encouragement as a mom on the "other side" of many of the issues and challenges Sarah is dealing with. Each chapter starts with a question from Sarah and an answer from Sally. "Dear Sally, I'm really struggling with being a mom today. I feel overwhelmed and underprepared. What if I fail my kids? Can I really do this motherhood thing well? Can I really love my children the way they need me to?" Sarah asks in Chapter 1. "Sweet Friend, Almost all mothers I know started out overwhelmed and eventually found their legs and began to create a rhythm in their lives. Please do not allow the guilt or inadequacies you are feeling to overwhelm your life...You see, the process of learning how to nurture our children usually always ends up crafting a bigger and more generous soul within ourselves and becomes a grace and beauty to our souls." 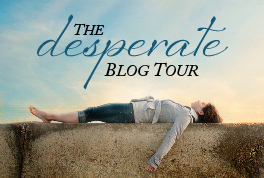 There are SO many quotable passages in this book that it's hard to just give you one or two, but if I had one main take away from reading Desperate, one theme that really struck a chord, it is that as both Sarah and Sally remind us...motherhood is NOT easy. When we think it will be we walk around feeling frustrated and disappointed. When we change our perspective, almost to that of approaching motherhood as a "battle" of sorts, we can train ourselves, prepare ourselves and equip ourselves to attack the days in a more prepared way. "Many of us start our roles as mothers with a "Cinderella syndrome," thinking that life is going to magically work out happily ever after. I know I did, and boy was I in for a tough ride. Hollywood movies in today's world tend to create the illusion that life is romantic, things work themselves out in the end, and a happy home is easily won. But this is a lie, completely detached from the reality of our lives." "All soldiers are trained to expect and anticipate war, so they are not surprised when the battle starts. Moms need to understand this is the reality of life with children in a fallen world. Getting angry and upset for children being selfish and demanding creates tress and havoc in the mind, emotions, and body of a woman. Prepare yourself and accept the limitations of your husband, children and home-- and of yourself. And then determine you will, in time, subdue your home, overcome in the fight for the hearts of your children, and find God's joy and blessing through your obedience." In addition to the wonderful content the book also includes thought provoking discussion questions, applicable Bible verses, and great action suggestions. If you ever have days when you feel desperate as a mom this book was written for you and I would highly recommend you picking up a copy. And lastly, because I have enjoyed this book so much in my own mothering journey and one of my heart's desires is to encourage you all in your own mothering journeys I have purchased an extra copy of the book to give away to one of you!!! 3. If you have a google account click on "Join this site" on the right hand side (where you see all of the little head shots) (1 extra entry). If you do #2 and/or #3 just let me know in the comments section below, or on my FB page so that I know! The giveaway will be open until the end of the day on Friday and I will announce the winner on Saturday morning! I'd love to read this book at some point! It's a great book!!! Thanks for stopping by! id love to read it bc im in the middle of this 'season' right now! Me too!!! I feel your pain...er, um...joyful craziness!! I would love to read this book too. Feeling "overwhelmed & underprepared" so often describes the way I feel, desperately wanting to raise our babies to honor God. Like the idea of changing perspective!